Winter driving has its challenges. Between icy roads and sometimes white-out conditions, it can be hard to control your car, especially if your vehicle has not been prepped for winter driving conditions. CID Auto Body and Paint, a San Marcos auto body shop, specializes in auto collision repairs and auto body, as well as PDR removal and windshield replacement. 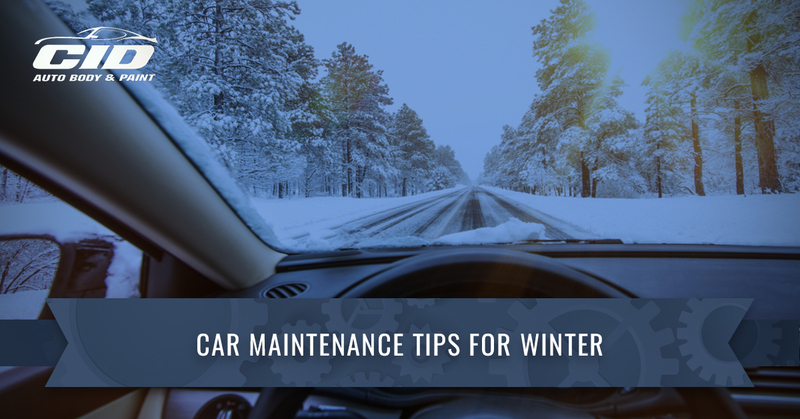 Below, we’ll offer up valuable winter vehicle maintenance tips, so you can stay safe on the roads. Contact us today! Change your oil. If you normally use conventional (or regular) oil, winter can be a good time to switch to synthetic oil if it’s appropriate for your vehicle type. Conventional oil is all-natural refined crude oil from the ground. Synthetic oil is manufactured oil, usually molecule by molecule, which eliminates imperfections in the oil. Cold weather starts can be easier on your engine with a full-synthetic oil because synthetic oil flows easier at lower temperatures and doesn’t require time to warm up to work efficiently. This helps to provide protection to the engine’s moving parts. If you’re not a fan of full-synthetic oil or your vehicle doesn’t support it, you can switch to a synthetic blend. A synthetic blend is both synthetic oil and conventional oil mixed together. If you are unsure which oil your car supports, check with your vehicle manufacturer, vehicle handbook, or mechanic for specific recommendations on which oil is right for your vehicle. Check your battery. Batteries tend to fail in the winter for a variety of reasons. Summer is hard on batteries as the extreme heat evaporates water inside the battery. When it’s cold out, the chemical reactions inside your car battery slow. Throw in the fact you are blasting the heat and defrost, demanding more power from your battery, and you’re ripe to have your battery quit on you. Invest in a new battery if you suspect your battery is beginning to fade on you, or consider keeping your battery on a charger when the temperatures dip. Ensure visibility. Driving in winter is challenging, but throw in the fact you can’t see out of your windshield, and what begins as challenging now suddenly becomes hazardous. First and foremost, check your windshield wipers. If you live in a snowy climate, it might be worth investing in windshield wipers with winter blades, as well as de-icing windshield fluid. Make sure all of your headlights and taillights are working and functioning properly. If you have a crack or a chip in your windshield, snow and ice can make it worse through the constant fluctuation in temperatures from the night to the day. San Marcos auto body repair shop, CID Auto Body and Paint, offers glass replacement and repair services, and we can have you in and out in no time with a new and/or repaired windshield. Check your tires. There’s a reason tires are invented for the snow. Snow tires have better tread and better rubber compounds. They also are designed to not harden at lower temperatures as all-season tires due, which can decrease traction. Your tires will need sufficient traction for optimal grip on the road. Furthermore, be aware that as temperatures drop, tire pressure decreases. Under inflated tires wear faster, are not as good at fuel economy, and can reduce handling and traction. Check your antifreeze. Antifreeze does just what it says: it’s against freezing. Antifreeze keeps the liquid in the engine’s cooling system from freezing and expanding, which can cause engine damage. An auto mechanic can test your antifreeze for strength and tell you the lowest temperature you can have for the engine to still be protected. Have your auto mechanic check your coolant reservoir as well to make sure it’s filled to the proper level. While you’re checking your antifreeze, check the radiator cap for leaks as well, which is what keeps your antifreeze in your vehicle, preventing engine overheating. Check your thermostat. Thermostats in vehicles can fail, especially if the coolant reservoir hasn’t been maintained properly. The thermostat is what regulates heat in your vehicle — crucial in the cold. Clean your fuel injector. An inexpensive additive to your gasoline, fuel injector cleaner helps to restore lost power and eliminate rough idling and hard starts. Existing water in the fuel system can freeze during extremely cold temperatures, which can then become a problem. Fuel injector cleaner will help to remove any existing water in your system as well. San Marcos auto body shop, CID Auto Body and Paint, believes vehicle maintenance is key for long-lasting and well-running vehicles. In the winter, the last thing you want is to have to get to work and your car won’t start, your heat won’t work, or you’re skidding all over the road from the icy roadway conditions. Car maintenance for the winter can prevent the majority of problems from occurring. If you need San Marcos auto collision repairs, contact CID Auto Body and Paint. We’re the best San Marcos auto body repair around. We repair vehicles when you get in an accident, paint cars when you need it, and also offer window replacement services. If you have a dent in your car, we also offer PDR dent removal to restore your car’s auto body. For any kind of auto body in San Marcos, give CID Auto Body and Paint a call. We offer free estimates and will have you back on the roadway quickly and efficiently. Call us today!